"What a breath of fresh air! "The Woman's Guides" seek to provide a comfortable, friendly place in which women can challenge themselves and learn new skills. 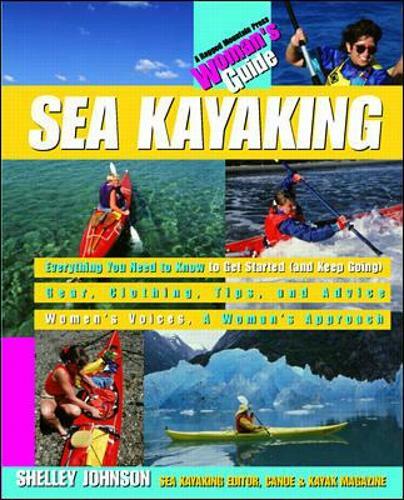 Reading "Sea Kayaking: A Woman's Guide" gave me a sense of camaraderie, like being back at camp with best friends." - Dagny Scott, Contributing Editor for 'Women's Sports', "SHAPE" magazine.Ragged Mountain Press Woman's Guides - the first book series designed for the growing number of women who are active outdoors. These comprehensive guides provide everything you need to get started and keep going. Throughout each book you'll find tips, advice, and words of wisdom from women who've done what you're about to do - learn a new sport. At last: books for women who love the outdoors, written in a woman's voice with a woman's approach to learning. "A winner!...Renowned outdoors and paddlesports writer, Shelley Johnson will inspire readers to get paddling." - Lafe Low, Executive Director, Adventure Club of North America.In "Sea Kayaking: A Woman's Guide" you'll find the knowledge and skills you need to become a self-sufficient paddler. Yes, you can load a kayak on a car by yourself...get in and out of your boat easily - without capsizing. ..help a capsized kayaker get back in her boat...perform (and even learn to love) an Eskimo roll! Shelley Johnson's fresh perspective and up-to-date presentation of techniques and equipment provide all the tools you need to become a confident, comfortable, capable sea kayaker! "I was pretty hesitant about paddling a kayak out into the ocean, but after reading Shelley's suggestions for overcoming fear, I was ready to try." - Louise Allen, new sea kayaker.